Nine Democrats in the bipartisan Problem Solvers Caucus are threatening to vote against the California Democrat's bid to be Speaker. 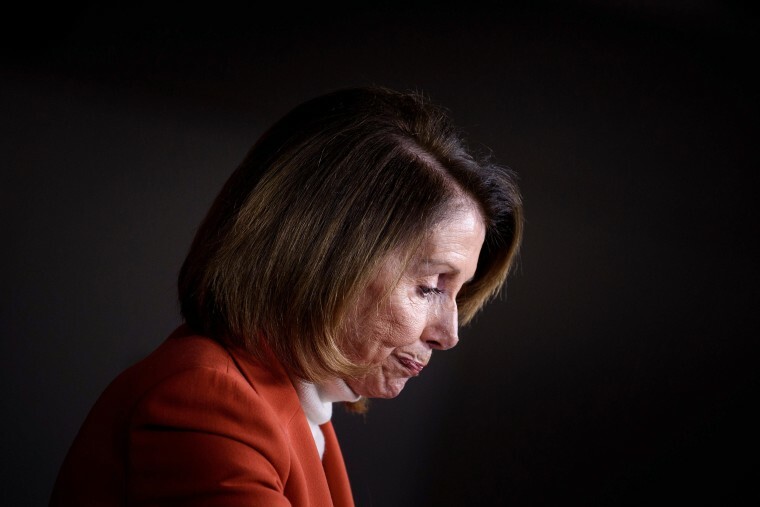 WASHINGTON — Nancy Pelosi is facing a renewed threat to her leadership of House Democrats from a group of moderates, creating a standoff that is highlighting emerging tensions between the emboldened left flank of her caucus and its expanded ranks of those in the middle. Nine Democrats in the bipartisan Problem Solvers Caucus, an offshoot of the moderate think tank No Labels, are warning they could vote against Pelosi for House Speaker unless she agrees to rule changes that they say will help "break the gridlock" in Congress. Pelosi is expected to cruise through an internal Democratic caucus meeting on Wednesday — which will vote on the rule changes before a vote on her leadership takes place — but she can only afford to lose a certain number of votes to any potential rivals when the entire House votes to elect the next speaker when the new Congress convenes in January. Progressives and moderates both saw their ranks swell with high-profile new members in the Democrats' midterms wave, with each claiming to have a mandate and vision for the future of the party — so clashes between the wings are inevitable. The Problem Solvers want changes to House rules that would weaken the power of party leaders by allowing bipartisan groups of lawmakers to move legislation directly to the House floor, circumventing the Speaker and committee chairmen. Rep. Josh Gottheimer, D-N.J., co-chairman of the group, said the proposed changes are meant to help House Democrats govern in an era of divided government. "The only way we're going to do that when the Democrats control the House with no control of the Senate and the White House is to actually find places where we can work together," Gottheimer told NBC News. Progressives, however, see the proposed changes as empowering the Republican minority and therefore President Donald Trump, just when Democrats have finally won control of the House and after progressives extracted a concession from Pelosi to have more of their members chair powerful committees. "9 Dems are choosing to hold the entire 220+ caucus hostage if we don't accept their GOP-friendly rules that will hamstring healthcare efforts from the get-go," tweeted Rep.-elect Alexandria Ocasio-Cortez, D-N.Y. "People sent us here to get things done, not 'negotiate' with an admin that jails children and guts people's healthcare." Others, like Neera Tanden, the president of the liberal Center for American Progress, asked why the Problem Solvers Caucus didn't push for the rule changes when Republicans in power. And Robert Zimmerman, a Democratic National Committeeman and political operative, charged the Problem Solvers are "enabling Trump and Congressional Republicans." The nine lawmakers argue that House rules must be reformed in order to craft bipartisan legislation that can realistic win approval in the Republican-controlled Senate and be signed by Trump. They also worry that emboldened progressives will force votes on controversial issues that may play well with their base, but could be politically harmful to their swing-district members' reelection prospects in 2020. They are pushing three proposed rules changes, a slimmed down version of the 10 revisions they first proposed in June. The first proposal would require the House to vote on any bill that receives at least 290 co-sponsors, which amounts to three-fifths of Congress, even if the Speaker does not want to bring the bill up for a vote. The second would require the House to vote on an amendment to a bill that has at least 20 Democratic and 20 Republican co-sponsors. And the third would allow each House lawmaker in each two-year Congress to introduce one bill for debate and a vote in a committee on which he or she serves as long as it has at least one co-sponsor from the other party. In a letter sent to Pelosi before the Thanksgiving break, the group suggested that they would only support her if she commits to embracing their proposals. Pelosi met with members of the group earlier this month and said she was broadly supportive of their goal for bipartisanship, but she did not commit to backing any of the proposed rule changes. She plans to meet with the group and Rep. Jim McGovern, D-Mass., likely the next chairman of the Rules Committee, again on Tuesday, according to a senior Democratic aide. House Democratic leaders have already agreed to the proposal that would bring bills with 290 co-sponsors to the floor, among other proposed rules changes from the group, the aide said. Pressed whether he plans to support Pelosi for speaker, Gottheimer stopped short of making any commitment, but he did indicate that he would only support a candidate who's interested in taking a different approach to governing. "We can't just obstruct for the sake of it and if we obstruct for the next two years and we don't get anything done, to me, it would be the exact opposite of what we heard in this last election from people," he said.